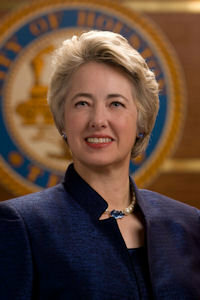 Tuesday was Inauguration Day for Mayor Annise Parker, City Controller Ronald Green, and all 16 members of Houston City Council. Annise D. Parker began her second term as mayor of Houston on Monday with a commitment to bring more jobs to the city and to tackle an ambitious to-do list that includes progress on public employee pensions, an independent crime lab, getting out of the jail business and alleviating homelessness. Immediately before her inaugural speech, she swore in the 16-member City Council, whose support she needs to implement her agenda. Seven of them are new. Afterward, several of the new members pledged to work with the Democratic mayor to solve problems. “My philosophy is: potholes, not partisans, ” said Republican At-Large 5 Councilman Jack Christie. Remember when the runoffs were a “strong repudiation” of the Parker administration? Yes, I know, new CM Helena Brown has sworn to be her arch-nemesis, but I daresay that from the Mayor’s perspective, getting Christie in return on the trade isn’t the worst deal ever. The new council members, however, have yet to flesh out their positions on how to solve those problems, and Parker’s speech was a broad sketch of what needs to be done, not a policy address. Parker relied instead on the optimism of Inauguration Day to put forward the idea that history is on the city’s side and that Houston residents will build what a recent magazine article called “one of the world’s next great cities” with audacity, a can-docharacter and a willingness to invest in their community even during tough economic times. She paid tribute to Houston as a city that got its unlikely start on a mosquito-ridden prairie, pioneered the artificial heart and played a central role in space exploration. “Everything we have done as a city has been a matter of vision and will, of taking what we have and deciding what we want, setting an impossible goal, and then creating it,” Parker said. My number one job for the next two years is to continue to bring more jobs to Houston. We will expand the programs we have already started to stimulate small business with access to loans and training. We will continue the Hire Houston First policy. We will work tirelessly to increase our role as the energy capital of the world and a world leader in the next high tech industrial revolution. Hard times prompt us to chart the latitude and longitude of who we are. Hard times test our character. The economy still dominates every conversation, and colors everything we do. Too many Houstonians are struggling to find jobs, to make ends meet. Our city workforce has also felt that pain. City employees have been furloughed, and more than 750 were laid off. We are doing more with less. We did not raise taxes. We did not mortgage our future with debt. We did not compromise public safety. We did not lay off a single firefighter or police officer. Many of our civilian employees stepped up and volunteered additional furlough days to help save the jobs of their colleagues. We took bold steps to address our aging infrastructure – finally recovering the full cost of this precious asset, emphasizing conservation, and setting aside funds to complete long neglected maintenance. In doing the responsible thing, we unknowingly prepared ourselves to be able to respond to the worst drought in our history. And I cannot envision voters in any other city in America, in the midst of a recession, doing the right thing, the prudent thing, and creating the funding to invest in critically needed flooding and drainage infrastructure. This is a visionary step akin to that in the 1950’s and 60s which created lakes Conroe and Houston and secured the water rights which sustain us today, or the commitment to set aside land and other incentives to encourage medical institutions to locate together and so lead to the largest medical complex in the world. Those will remain our strengths – there is progress yet to be made on pension security for both the city and our retirees, an independent regional crime lab, phasing out the city jail and progress against homelessness – these are challenges we are committed to address and have already begun. Seems like a good idea to remind people that the city is actually going to do something with the money collected from the drainage fee. I’d recommend doing a lot more of that over the next two years. Still no more details about the crime lab. Calling it “an independent regional crime lab” sure sounds like the original city-county jointly funded proposal to me, which makes me wonder what the deal was in that KHOU story. The one item here that’s less familiar is “progress against homelessness”, which I presume refers to the announcement from late November about a partnership with the U.S. Department of Housing and Urban Development (HUD). I presume we’ll hear more about this in the coming months. I was not able to attend the inauguration, so I don’t have any personal impressions to share. If you were there, what did you think? Houston Politics has more. I am sure the Mayor will be happy with Jack Christie. As you know I supported Jolanda Jones and well she lost. When the Mayor turned over the time to the Council Members she started with Christie. The Mayor said somthing like this “We will start with Council Member Jack Christie who is sitting to my far right”. During the course of his time of thanking his supporters he told the Mayor that while he might be sitting to her far right that doesn’t mean he will be far right. He didn’t have to make that statment in public but he chose to do so putting it right in the face of all the Republican’s who supported him and don’t like the mayor. This was a clear sign he will be working with the Mayor. I couldn’t help but tell my Republican friends who supported Christie over the Jones “I told you so”. Sighhhhhhhhhhhh. I take exception with many statements made by the Mayor, one of the biggest being her denial of taking on more debt. She demanded, upon threat of layoffs, that each of the three pension systems allow the city to give an IOU during her term that amounted to well over $100 million dollars this fiscal year alone. While some call this feat “kicking the can down the road”, a relatively innocuous sounding term, it translates into sabotaging the long term viability of each. If any of them were fully funded and this were a single year matter, it would not be such a big deal but we all see the storm brewing on the horizon. The Bill King/GHP types out there are banking on the city to continue such funding schemes in their efforts to eliminate or greatly reduce pension benefits. Without a corresponding increase in direct pay, that will leave a great many employees without a safety net since few, if any, of them are eligible for Social Security. I caution all city employees to watch what happens very closely and start saving as much as you can, those in deferred retirement situations might want to get ready to bail before it gets taken away. If Jack Christie is one the Mayor will work well with, then that is just that a little more marginalized District A will become under Helena Brown. Besides casting herself as the Mayor’s nemesis, (in a strong Mayoral form of government, good luck with that Helena), Helena has alienated Noriega & Costello. Burk is an unknown and she might get some alliances with Bradford, but those are big maybes. She is big time on the outs with Rodriguez of course, as well as Gonzalez, Adams, and Sullivan. I don’t see Laster, Cohen or Davis aligning with the ultra conservative tea-partier. Hoang and Pennington, maybe. Again, big maybe. The ones that will suffer in all of this will be the residents of District A. Helena will find out the hard way that she will be totally ineffective in derailing anything the Mayor wants to do unless she can win over strong alliances at the horse shoe. So far, that hasn’t happened, more like the opposite. Clearly the only person who will perform as a Council Member in a way satisfactory to Paul Kubosh is Paul Kubosh. So why doesn’t he run? hobby,there you go again-sometimes i just wonder where you come up with your “mathmatics”-first of all-i am a huge supporter of helena brown-no doubt,as i have stated before the mayor should have stayed out of the brenda,helena race,it was poor judgement on the mayors behalf for getting involved,this was a mistake- hobby-she doesnt need to be aligned,shes a district a council member,voted in to represent her district,this is what helena will do,what stardig refused to do. The mayor didnt fall off the truck last night,she knows which way the cookie will crumble if she attacks helena brown.hobby-iam not good for much-but i am solid on 2 to 5 percent on a mayor’s race and i know the kubosh brothers are good for 12 to 14 percent of the vote,if not more,the truth is hobby,lets hope the mayor plays it perfect,because thats what it will take to win a final term,i know if she goes at brown i will be outraged and at the ready to move the voting pool-right side,so lets hope she hits the triple seven’s. Hobby, I disagree with your assessment of the politics of city council. The mayor is weak and in trouble in my opinion. Also look at the recent 16 to 1 vote. That should tell you something. Jj I thought you paid better attention to our family blog here. I don’t live in the city. I spend 16 hours a day in the city but just don’t live here. Our host made that clear in the red light camera referendum. The mayor should take note that if she treats district a unfairly she will get push back. Well we’ll hide and watch and see how it unfolds. Hobby….agreed watch and blog about it. Is living in the city or district been a requirement that is strictly adhered to to be able to run for office….just buy/rent a cheap flop house in whatever district and live where you want. Robert, if I did that then I would be just as disingenuous as the politicians I complain about.